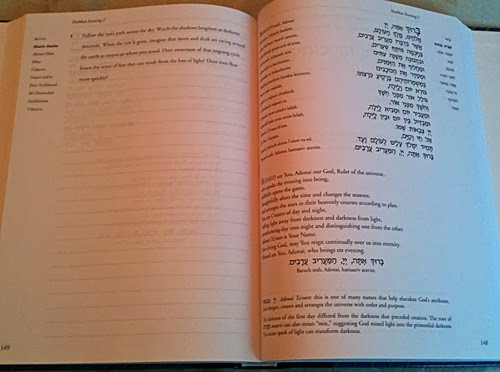 Art journaling .. in a siddur? Sorry, these are less than brilliant pictures. I used my iPhone to take them in the early morning before heading off for the day. This is the journal edition. The introduction says it's aimed at youth, but I think this is a brilliant idea for all ages to use, and in fact, the Episcopal Church should steal this and use it for the Book of Common Prayer. 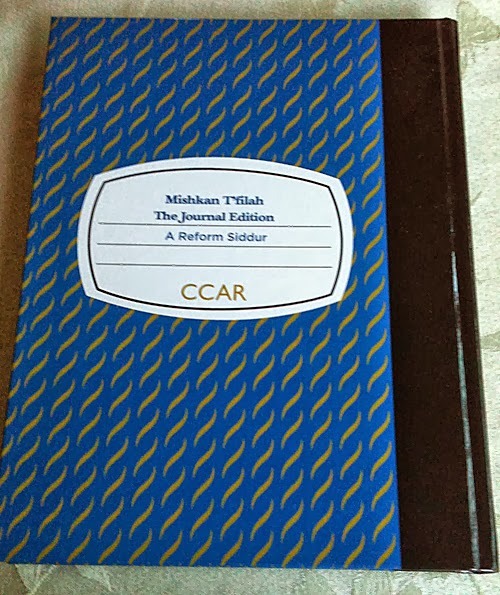 This journal edition of the Mishkan T'filah isn't identical to the prayer book of the same name. It has sections and pages removed to make space for the journaling. My current plan is to write my responses in pencil on the page, and then to go over the top with pen illustrations. I've tested a bunch of pens for bleed so I think it'll look quite pretty when it's done. Sometimes there are question prompts (as in the picture above) and sometimes the page is just left blank (well, lined) for your response. If you're interested, you can order it from CCAR Press.